Would late hours benefit Beacon eateries? 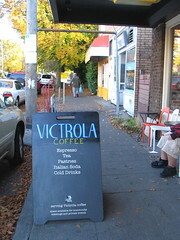 Would you visit Victrola if it was open later? Photo by Wendi. Recently, neighbors on the mailing list have discussed the hours of local restaurants such as El Quetzal which close early, and whether they would gain more business with later hours. Jake London put a survey together to get some harder numbers about how people feel about this. The survey discusses El Quetzal, Victrola, and Kusina Filipina, and asks whether later closing times would increase the likelihood that each survey taker would patronize these businesses in the evening hours. The survey has only three questions, so it’s short and quick. You can take it here. Jake says the survey will be open for a week or so. Stay tuned for the results. Ooh, very interested to see results on this!! I know that I’d certainly love it if Victrola was open later, even just a couple of nights a week – it’d be so nice to have a coffee and dessert option in the evenings! It would be great to have different options in the neighborhood, especially with a little “downtown core” growing. Nice survey. I hope the neighborhood starts to develop a few nightlife options! Nothing too boisterous, but regular dining hours and a bar or two would be most welcome. Personally, I would trade evening hours for Sunday hours in a heartbeat. It would be nice to have another place to drink a beer or cocktail until later in the evening, but I rarely have a need for a full dinner or coffee at 9pm in the neighborhood. I do, however, frequently walk down Beacon on Sunday afternoon and feel disapointment that my favorite businesses are closed. Anyway, I actually thought El Quetzal was going to start staying open later with their remodel, which included what seems like a small bar area with a TV. Their drinks are pretty tasty and I do admit that a few of their tacos from a limited evening menu would be go well with a margarita. I’ve always thought the early closing hours were crazy. People mostly work in other parts of the city, and by the time they get home, everything is closed. They should look to something like The Wedgwood Broiler as an example of a neighborhood restaurant that does a great business, primarily from people within just a few miles of their location.